Over the past few years, the district has been providing opportunities for students to travel to some amazing far-flung locations. Each trip is enriching, and students learn about themselves, as well as about the places they visit. 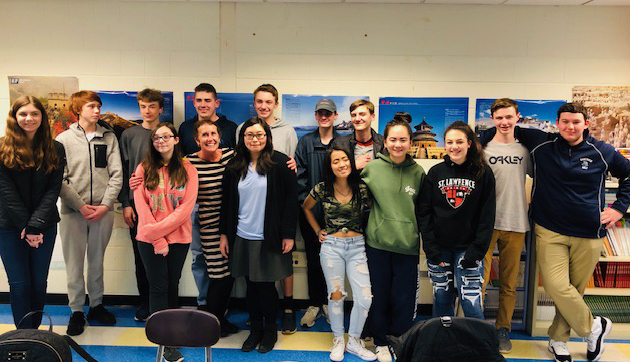 The Sandwich Public Schools sponsors annual summer travel to National Parks for students entering 7th grade and, some years there is a summer service trip to the Dominican Republic for Sandwich High School students. In April 2018, a group of grade 8-12 students visited Paris and in April 2020, a group of grade 9-12 students will travel to Paris and Normandy. This April, students are going to Beijing, China in an cultural exchange through our partnership with Boston Ivy. Each trip is a bit different; all of them will be amazing! Following is an update on this year’s trip to China from Hengjia Liu, our Mandarin teacher. We have 13 students going on this trip, include one 8th grader, 5 freshmen, 5 sophomores, one junior and one senior. Our chaperones are SHS School Nurse Kathy Grant, Latin Teacher Mary Alice Moynahan, and me. We’ve been preparing and getting ready for the trip since this school year started. Our partnership with Boston Ivy has been very helpful regarding the trip planning and host family screening. In class, we try to practice speaking as much as possible based on real life situations. Our students went on field trip to Chinatown last year and Peabody Essex museum this year and just getting a taste of China. Besides Mandarin class, we held the China trip meeting once a month with students and their parents since last October. Each meeting, we try to get the China trip members be familiar with each other, and in the past meetings we talked about Visa application, Cultural difference and overlap, itinerary and traveling tips; we worked on student profile both in Chinese and English, we shared host family information and so on. Our students just started the communication with Chinese host families, they will get to know about each other before they meet. We also talked about Chinese school culture and packing information. Now, I think we’re really ready to go. We’re leaving this Saturday and we will have a bus ready so as to leave together from Sandwich High school to the airport. 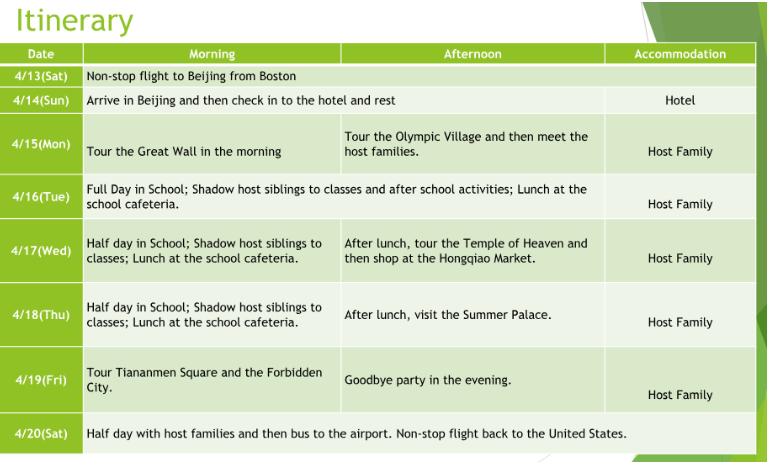 We will spend a whole week in Beijing, we will visit the Great Wall, the Forbidden City, the Temple of Heaven, the Summer Place, the Olympic Park and so on. All those places of interests we used to talk about in class, and now it is time for our students to visit them in person. I think the unique part of our trip is to let our students visit our sister school in Beijing. 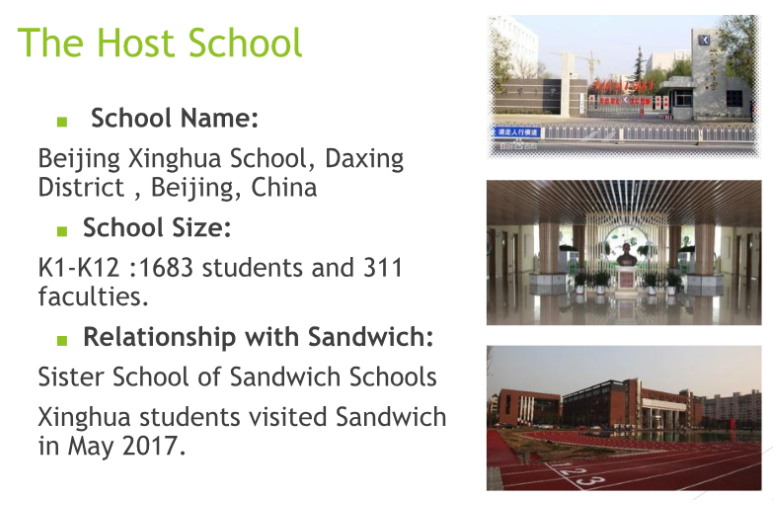 Beijnig Xinhua middle and high school has been partnership with Sandwich schools and their students visited us in 2017. Some of the students on this trip have hosted the Chinese students, and this time, our students are going to visit them in Beijing. They’re really looking forward to meeting them in a week. While in school, our students will shadow some science and Math classes and see what their Chinese peers are learning. Students will also have special Chinese culture enrichment classes and activities planned just for them. For the sports part, they will participate the table tennis club activities. Another exciting event is there will be a basketball game between our students and Chinese students in our sister school in Beijing. Our students have been practicing on that as well.